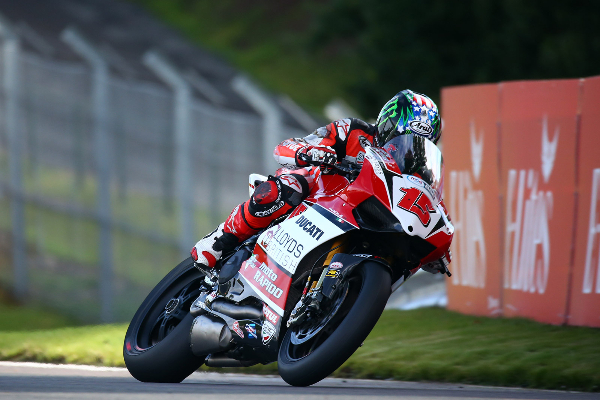 American John Hopkins upstaged the title-chasing pair of Josh Brookes and Shane ‘Shakey’ Byrne in the dying moments of free practice two, topping the times ahead of the triple-header ninth round of the MCE Insurance British Superbike Championship at Oulton Park. The former MotoGP and MCE BSB runner-up stormed to his fastest lap of the day on the Lloyds British Moto Rapido Ducati to close in on the lap record time ahead of the opening race which takes place at the Cheshire circuit following Datatag Qualifying tomorrow (Saturday). Hopkins, who claimed his first ever victory in the series at the circuit back in 2011, is poised for more of the same and that could spell problems for both Brookes and Byrne who are aiming for the maximum Podium Points haul ahead of the Showdown opener at Assen. This round is crucial to the championship aspirations of the chasing pack who are all aiming to join Brookes and Byrne as Title Fighters in the final Showdown. Outsider Luke Mossey on the Quattro Plant Kawasaki set the sixth best time, just adrift of Danny Buchan and Christian Iddon. The Tyco BMW pairing of Michael Laverty and Tommy Bridewell, who both currently hold places in the top six, were seventh and eighth respectively on combined free practice times and will be pushing to close the deficit ahead of Datatag Qualifying and the first race tomorrow. Today’s sessions marked the comeback of both Stuart Easton and James Ellison who both return from injury. PBM Kawasaki’s Easton currently holds fifth place in the overall standings and just six weeks after his Brands Hatch injury valiantly set the 12th fastest time, just 0.009s separating him from the JG Speedfit Kawasaki rider who also is battling for a Showdown spot. It was a disastrous opening day for the Honda Racing team as Dan Linfoot bids to make the cut for the Showdown; he currently holds seventh place in the overall standings but could only set the 20th fastest time. “I had no idea of my time as I did not have the GPS switched on and during that lap I made a few little mistakes so I thought it was slower than that! We had run with used tyres earlier as we worked on the bike, then put in a new one for the afternoon, and that with the adjustments to the suspension made a big change to my lap times.